Updated on 16 March 2018 to include the 1920 American map of the proposed boundary between Turkey and Armenia as determined by US President Woodrow Wilson. UN map of Armenia with the Araks corridor highlighted. One of the most enduring myths of Caucasus history involves the little-noticed and oddly placed border between Turkey and Azerbaijan. At first glance at any map, this border is not readily apparent and seems almost nonexistent. However, on closer inspection, one can see a small sliver of land jutting out from Turkey’s northeastern Igdir Province to the northern Sadarak and Sharur raions of Azerbaijan’s Nakhichevan Autonomous Republic. This corridor is geographically defined by the Araks River to the north and the Lower Karasu River to the south. How did this strange border come into being? A common misnomer among historians of the Caucasus is that the border emerged as the result of a territorial exchange between Atatürk’s Turkey and Reza Shah’s Iran in the 1930s. It was created, the narrative goes, by the cession of territories from Iran to Turkey in exchange for the cession of Turkish territories in the mountainous Kurdish districts further south to Iran. The intent for Ankara, the narrative asserts, was to create a direct link with the exclave of Nakhichevan, part of then-Soviet Azerbaijan. Any review of the historical record will show that in the 1930s, Turkey and Iran did indeed delineate and finalize their border in what was known as the Tehran Convention. Naturally, this did involve exchanging small territories along the frontier between the two countries. However, was the Araks corridor part of this territorial exchange? A look at the actual text of the Tehran Convention and historical maps of the Caucasus dating from the early 19th century indicate that this was not the case. 1832 Tsarist Russian map of the Caucasus with the Armenian Oblast. Courtesy of the National Archives of Georgia, Tbilisi. 1878 French map of territorial adjustments in southwestern Transcaucasia, according to the terms of the Treaty of San Stefano, from Armenia: Political and Ethnic Boundaries, 1878-1948, edited by Anita L.P. Burdett (Cambridge: Cambridge Archive Editions, 1998). 1903 Tsarist Russian map of the Caucasus, from Wikimedia Commons. 1919 American map of southern Russia, Ukraine, the Caucasus, and the Black Sea region. Courtesy of the Stephen S. Clark Library at the University of Michigan, Ann Arbor. 1919 map of the Armenian Republic in the Caucasus, put forward by the Armenian delegation at the Paris Peace Conference, from Historic Maps of Armenia: The Cartographic Heritage by Rouben Galichian (London: I.B. Tauris, 2004). 1920 American map of the proposed boundary between Turkey and Armenia as determined by US President Woodrow Wilson. Courtesy of the Library of Congress. 1922 British military survey map of the Mount Ararat region, showing the borders prior to World War I, from Armenia: Political and Ethnic Boundaries, 1878-1948, edited by Anita L.P. Burdett (Cambridge: Cambridge Archive Editions, 1998). Notably, the new frontier, placing Lesser Ararat under Turkish administration, was drawn onto this map at a later date. Consequently, both the earlier and later Turco-Persian borders are illustrated here. 1924 Soviet map of the Armenian SSR within the Transcaucasian SFSR, from the personal collection of this writer. Notably, some relevant maps confirming the existence of the corridor prior to the 1930s can also be found throughout Artur A. Tsutsiev’s Atlas of the Ethno-Political History of the Caucasus (both the original Russian edition and the English translation) and Robert H. Hewsen’s Armenia: A Historical Atlas. The Araks corridor is often regarded as part of the historic region of Surmali, centered on the city of Igdir, which now largely corresponds with Turkey’s present-day Igdir Province. Surmali (also known as Surmalu) takes its name from the ruined medieval Armenian city of Surmari, the castle of which remains standing today in the village of Sürmeli, near the salt-mining town of Tuzluca (historically known as Koghb or Kulp). Located on the Turkish-Armenian frontier, the castle is unfortunately inaccessible to travelers due to border restrictions. The historic city of Surmari was described by many contemporary observers, including the Armenian historian Stepanos Orbelian and the Spanish ambassador Ruy González de Clavijo. According to Vladimir Minorsky in his Studies in Caucasian History, Antoine-Jean Saint-Martin in his second volume of Mémoires historiques et géographiques sur l’Arménie, and Guy Le Strange in his 1928 translation of De Clavijo’s Embassy to Tamerlane, the name “Surmari” is derived from the Armenian “Surb Mari,” or “Saint Mary.” Over time, this evolved into “Surmali” and eventually was used to denote the entire surrounding region as opposed to the ruined city alone. Under Tsarist rule, the Surmali region was administered as the Surmalinskii Uyezd of the Erivanskaya Guberniya. Again, it is true that most of the uyezd’s territory does indeed correspond to Turkey’s present-day Igdir Province. Yet, within the administrative structure of the Erivanskaya Guberniya, the Araks corridor was actually not administered as part of the Surmalinskii Uyezd, but rather as part of the Erivanskii Uyezd. The Araks corridor was merged with the Surmali region during the cession of the two areas to Kemalist Turkey in accordance with Article IV and Annex I of the 1921 Treaty of Kars with the Russian SFSR. The combined territory was initially administered by Ankara as part of the Agri Province (known as the Beyazit Province until 1927). However, in 1934, it was removed from the administration of the Agri Province and was governed as part of the Kars Province until 1993 when it was detached and established as the Igdir Province. In addition, Article V and Annex III of the Kars Treaty stipulated that the Nakhichevan region should be assigned to the Azerbaijan SSR and should include the Sharur district of the Sharur-Daralagyozskii Uyezd and the Sadarak area of the Erivanskii Uyezd, bordering the newly-acquired Araks corridor. This would allow Soviet Azerbaijan to share a small but strategically significant border with Turkey. The border was especially important to Turkish nationalists in Ankara, many of whom were part of the previous Ittihatist government, which sought to forge a connection with the Turkic-speaking peoples of Transcaucasia in their Pan-Turkist designs. Given this evidence, where did the confusion emerge with the Turkish-Iranian border treaty? The source of this confusion was most likely the fact that another territory in the region—i.e., the remaining portion of the Ararat plateau—was among those exchanged between Iran and Turkey. Further, Iranian diplomats continued to dispute the status of Surmali and the Araks corridor until the issue was finally resolved in 1934. The Ararat plateau had been divided between the Persian and Ottoman Empires with the Treaty of Zohab in 1639. This arrangement lasted until the Russo-Persian war of 1826-28. In 1828, by the terms of the Treaty of Turkmenchai, the greater portion of the plateau, including the northern slopes and peak of Greater Ararat, passed into the control of the Russian Empire. It initially became part of the short-lived Armenian Oblast and later the Erivanskaya Guberniya. The Persians retained administration over Lesser Ararat while the Ottoman Empire retained the southern slopes of Greater Ararat within the Sanjak of Bayazit (part of the Erzurum Vilayet). From 1828 to 1918, the plateau remained divided between the Russian, Persian, and Ottoman Empires. For much of the period between 1918 and 1920, the Russian section of the plateau was controlled by the short-lived Democratic Republic of Armenia. However, after the Turkish-Armenian war and the Sovietization of eastern Armenia, it passed into the control of Turkey with the 1921 Treaty of Kars. From that time until the 1930s, the plateau was divided between two states: Iran and Turkey. However, by the end of the 1920s, Turkey was facing a major crisis in the Ararat region. Atatürk’s assimilationist “Turkification” policies had greatly angered local Kurds. Since the establishment of the Turkish Republic in 1923, there had already been one major Kurdish uprising. This occurred in 1925, in the vicinity of Diyarbekir and was brutally put down. The rebel leader Sheikh Said was executed by hanging. The uprising in the Ararat region would be the second attempt by the Kurds to revolt against Ankara. A Kurdish Republic of Ararat was proclaimed in 1927 and an insurgent war broke out between the Turkish state and Kurdish rebels that lasted four years. The mountainous terrain and relative inaccessibly of the Ararat plateau worked in favor of the Kurds. Border security with Iran was not well-enforced and the Kurdish rebels could easily retreat to the Iranian section of the plateau. Ankara decided to put an end to this and sought to extend its control over the entire Ararat region. In the course of the Kurdish revolt, in order to rout the rebels, Turkey intervened in the Iranian section and remained “in actual occupation of this area for a considerable time.” According to historian George Bournoutian, Tehran complained to Ankara about this intervention. Ankara responded that Tehran had to do more to enforce its border security. The issue emphasized the need for border talks between the two countries, which had already been underway since 1926. To secure its position, Ankara sought to formalize its de facto control over Lesser Ararat. This consequently became one of the main points of negotiation between Iranian and Turkish diplomats in the 1930s. The Tehran Convention of January 1932 determined that “the whole of Mount Ararat would be within the boundaries of Turkey, while, by way of compensation, a corresponding area further south would be transferred to the Persian side of the line,” in the words of a British diplomatic cable from Ankara. The same information on the Tehran Convention is confirmed on page 92 of the English translation of Tsutsiev’s Caucasus atlas (see full map here and detail here) and on page 243 of Hewsen’s Armenian atlas (see full map here and detail here). According to a British diplomat in a confidential cable from Persia dated 1 July 1932, the border was “pushed eastwards so as to give an area of some 60 square miles to Turkey. This, the Northern Zone, is the most important strategically, as it gives to Turkey the control of the whole of Lesser Ararat, a cession which will, it is hoped, enable her to deal more effectively with the Kurdish tribes of the neighbourhood.” The Kurdish Ararat rebellion may also explain why the nervous Turkish government decided to remove the Surmali region with the Araks corridor from the administration of the Agri/Beyazit Province in 1934. These objections delayed the implementation of these final border demarcations, until Reza Shah met with Atatürk in Ankara in the summer of 1934. According to Bournoutian, Reza Shah initially favored Iran acquiring the Araks corridor, but ultimately ordered his diplomats to drop their objections, arguing that Tehran and Ankara needed to work together and end their “past enmity and rivalry” in his own words. Thus, the issue was resolved and the border, with minor modifications, was finalized in the Treaty of Sa’dabad in 1937. Note: The 1932 Tehran Convention is also known as the Turco-Persian Convention or the Turco-Persian Frontier Agreement. The official agreement, signed on 23 January 1932 is titled Accord relatif à la Fixation de la Ligne Frontière entre Perse et la Turquie in French and Agreement Regarding the Definition of the Frontier-Line Between Persia and Turkey in English. The full French text of the treaty can be found in Anita L.P. Burdett’s Armenia: Political and Ethnic Boundaries, 1878-1948 (Cambridge: Cambridge Archive Editions, 1998), 959-962. A full English translation was published in the League of Nations Official Journal from February 1935 on pages 237-239. The date of publication (after Reza Shah’s meeting in Ankara with Atatürk) is noteworthy. “Agreement Regarding the Definition of the Frontier-Line Between Persia and Turkey,” The League of Nations Official Journal 16, no. 2 (February 1935): 237-239. Bidwell, Robin, ed. British Documents on Foreign Affairs: Reports and Papers from the Foreign Office Confidential Print, Part II, Series B (Turkey Iran, and the Middle East,1918–1939), Volume 26 (Persia XI, January 1931-October 1933). Bethesda, MD: University Publications of America, 1994, 138-139. Bournoutian, George A. 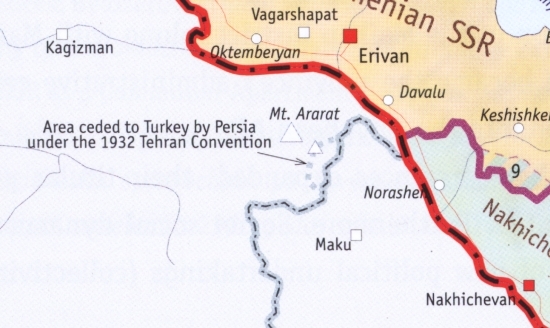 “The Iran-Turkey-Armenia Borders as Depicted in Various Maps,” Iran and the Caucasus 19, no. 1 (2015): 97-107. Burdett, Anita L.P., ed. 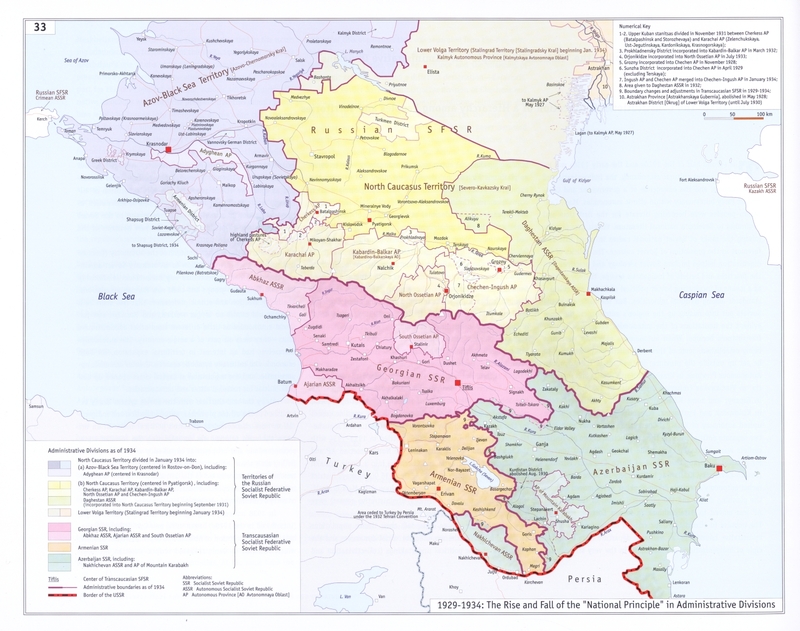 Armenia: Political and Ethnic Boundaries, 1878-1948. Cambridge: Cambridge Archive Editions, 1998, 953-968. De Clavijo, Ruy González. Embassy to Tamerlane, 1403-1406. Translated by Guy Le Strange. New York: Harper & Brothers, 1928, 351-352. Hewsen, Robert H. Armenia: A Historical Atlas. Chicago: The University of Chicago Press, 2001, 115-118, 125, 128-130, 168-176, 213-215, 238, 243. Minorsky, Vladimir Fyodorovich. Studies in Caucasian History. London: Taylor’s Foreign Press, 1953, 53. Saint-Martin, Antoine-Jean. Mémoires historiques et géographiques sur l’Arménie, tome second [Geographical and Historical Memoirs of Armenia, Volume Two]. Paris: Imprimerie royale, 1819, 226. Tsutsiev, Artur A. Атлас этнополитической истории Кавказа (1774-2004) [Atlas of the Ethno-Political History of the Caucasus (1774-2004)]. Moscow: Europa Publishing House, 2006, 16-72. ________. 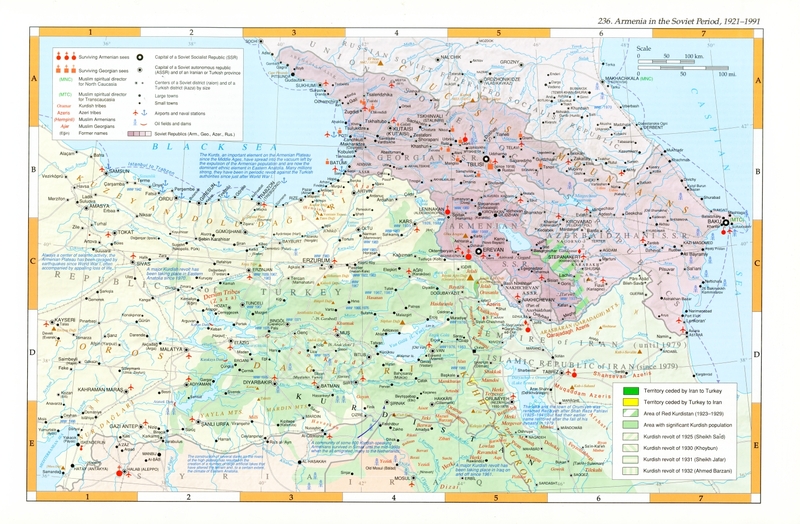 Atlas of the Ethno-Political History of the Caucasus. Translated by Nora Seligman Favorov. New Haven: Yale University Press, 2014, 14-92.